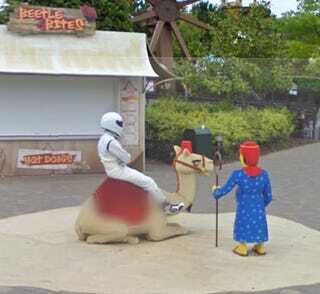 The Stig Caught By Google Street View... At LEGOLAND? Google Street View's cameras indicate Top Gear's tame racer The Stig has left the chilly shore of Loch Ness for the more exciting confines of LEGOLAND UK. Why did they blur the camel's hump? The Stig isn't merely the anonymous star of BBC2's automotive extravaganza, he's becoming something of a Kilroy on Google Maps in the UK. First he appeared at Loch Ness and now at LEGOLAND. There's also another Stig sighting slightly further down the way in front of a gigantic Lego pharaoh.